Looking back, I wish I had been able to record my every conversation with him. I remember wonderful stories as he reminisced about his career, but many of the details have been lost. Thankfully, however, I did take extremely detailed notes during his lectures at USC. I recently discovered my old notebooks and found that I had written down 25 thoughts precisely as he said them. I took the time to put quotations around them and underline them, as if to remind my future self that these were, indeed, Elmer’s exact words. Many of the quotes are as relevant today as they were then, and they all offer a glimpse of his creative process and political savvy at the peak of his accumulated wisdom. For the past five weeks, I have posted one quote a day on Facebook and Twitter, with the hashtag #ElmerWisdom. 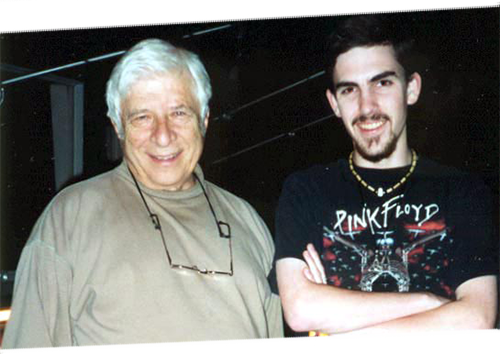 Elmer was a passionate educator, and loved to share his wisdom with younger generations, so I know he would approve. The response was overwhelming. Fans, friends and family all chimed in with their reactions. It seemed that everywhere I went, someone would bring these quotes up in conversation, and say they couldn’t wait for more. The majority seemed to resonate very positively. A handful inspired heated debates. I knew that I would have to assemble them all into a blog entry so they could always be found in one place. My original intention was to put these out in the world without offering my own opinion on them. I’ve realized, however, that is essentially impossible. In a way, these quotes say as much about me as they do about him, because these are the ideas my young mind felt were worthy of being preserved precisely. So, reluctantly accepting my role as the medium through which these ideas have been conveyed, I have assembled them here and offer personal commentary on a select few. This is one I only partially agree with. Applied to film, this is essentially right. In my opinion, Elmer was warning us that getting bogged down in overly-complex intellectual ideas is counterproductive to our task at hand, which is to communicate an emotional story. However, the medium of television has evolved since he said this and I believe it merits an addendum to this idea. In television, the composer’s relationship with the audience is built over a much longer period of time. We can reward the audience with subtle musical details that will seep in over multiple episodes or even multiple seasons. For example, my backwards palindrome “Da Vinci’s Demons” theme has a complex intellectual conceit behind it that may or may not ever be noticed by a viewer. However, it remains a catchy tune that satisfies the needs of the show first and foremost. As Elmer suggested, of course, communicating simple emotional ideas to the audience on their first viewing remains the composer’s absolute highest priority. If you’re a composer trying to work in the industry, tattoo this on the palm of your hand. I hear Elmer’s voice say this in the back of my mind almost every time I have a conversation with a producer or director. Focus on the aspects of the film the filmmakers are actually comfortable talking about: the story, the characters and the audience’s reaction. Deal with the musical details later. I think Elmer felt that if filmmakers could answer all the film’s musical questions without dealing with a composer, they would just do it themselves. However, I have encountered filmmakers who know a great deal about what they want, but also have the personal security and humility to allow a composer to improve on their vision. In many ways, that situation is actually the ideal. This is the quote I understood the least at the time. I was young and fiercely competitive. Honestly, I wish I’d taken this more seriously back then. I take it to heart now. This is a painful lesson I seem doomed to learn over and over again. I tackle projects or even individual scenes that resonate very personally. My mind latches on to a specific idea and it becomes the essence of what I’m doing. Sometimes, this leads to innovation and fuels my creativity. On other occasions, it simply blinds me to what the filmmaker is actually trying to say and I end up scoring an imaginary project, not the actual one at hand. Cues written in this mind-set are almost always thrown out. This has not yet happened to me. I disagree with this sentiment, but included it on the list because it informs us about the man who said it. Though he absolutely knew his immense influence in the industry, Elmer was, at heart, a modest man. I think he believed that his scores to films like “The Magnificent Seven” and “The Great Escape” were remembered because those films were so successful. Without question, this was the most controversial post and the response caught me by complete surprise. In the late 1990’s, when Elmer said this, new digital technologies had enabled temp music to grow into an industry practice for post-production. The process allows directors and editors to experiment by placing soundtracks from other projects in their film, often before a composer is even hired. This can cause problems for the eventual composer when filmmakers fall in love with their temp, which they’ve inevitably heard hundreds of times more often than new music that’s been composed for them. Historically speaking, composers and filmmakers have bristled over what we now call “Temp Love.” But, the technique is here to stay and for good reason. Temp scores often reveal a general sense of what works and what doesn’t, and that can actual spare composers needless rounds of revisions. Temps occasionally lead to composers landing a job when filmmakers latch on to a sound they like. And sure, sometimes temp cues are hilariously bad when they’re cut in by someone with no ear for music, but I’m more than capable of zoning out a bad temp. And I’m occasionally inspired by a good one. Perhaps it was my naiveté, but until I read the responses fueled by this quote, I had no idea that composers still harbored resentment of temp scores. Elmer was coming from a different era. He worked for decades in an industry that changed very quickly in his final two decades. He viewed temp scores as taking away from his creative freedom, whereas I view them simply as simply a new tool for communicating with filmmakers, like synth mock-ups, digital video or mp3s. Like all new tools, they are good most of the time, bad some of the time and simply not a part of the creative equation the rest of the time. Elmer was actually quoting a well-known line from composer Alfred Newman. The original wording may have been different. Regardless, this one hits close to home. In the late 1990’s, trends in film music were veering away from all the things Elmer loved about the art: melody, character and emotion. I understand why he felt this way. I feel, however, that this pendulum is starting to swing back. I have to think there are some contemporary scores out now he would be pretty excited about. For those smart enough to listen, this could perhaps be the single most important piece of advice here. Discovering these quotes I’d written down on the eve of my professional life was a revelation to me. 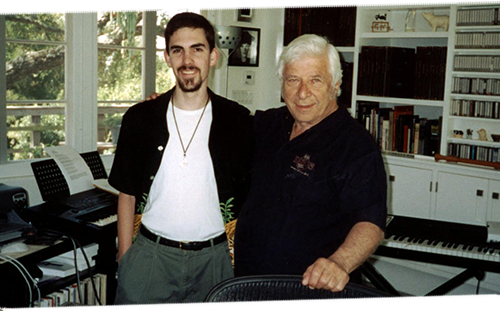 Elmer Bernstein had an impact on my life that can never be fully explained. I’m grateful for the opportunity to learn from him, and for this chance to share some of his wisdom with all of you. This has been a profound and emotional experience for me and brought back a flood of fond memories. I have so many more stories of my time spent with Elmer, perhaps I’ll write them down as future blog entries one day. Until then, keep loving whatever you do.